Hey guys! I know it's been a while since I've updated you all on my reading, but to be honest, I haven't really been reading much. The week of 6th March, I was away on a camping trip, so I didn't get in much reading at all. Last week however, was much better in terms of reading! 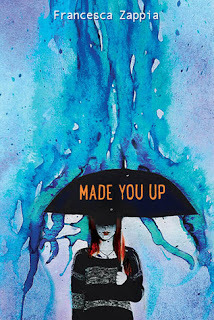 I finished reading "Made You Up" by Francesca Zappia (look out for my review this week). This book is about a schizophrenic girl attempting to adjust to normal teen life when she stumbles upon a person she always thought was imaginary. I also finished "Poison Study" by Maria V Snyder, a young adult novel about a prisoner/poison taster in a militarist country. The series soon turns into a fantasy one. It's a series that you can go through in a month, as the language is colloquial and simple. 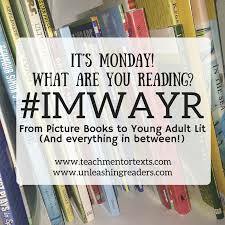 This week, I read"Magic Study" the second book in the "Chronicles of Ixia" by Maria V. Snyder. They're quite light reads, and I've had a lot of free time on my hands. I've been re-reading "The Giver" by Lois Lowry for a school assignment. For those of you who don't know, "The Giver" is about a futuristic society where opinions and expressions don't exist. Everything is black and white and only one person has any memories of the real world. I recently visited "Full Circle" Bookstore in Delhi. For those of you living in the area, you should definitely check it out, it has a lot of books that I've never found in Indian bookstore. including recent releases of YA and Debut Authors. I picked up "I am the Messenger" by Marcus Zusak, which I hope to read this week. Well, thanks for stopping by both this post and the review to find out my thoughts! Made You Up is one I've seen around and hope to read at some point. The Giver is one of my all time favorites as well. You really should read Made You Up- get to it soon, before you forget about it, I promise you won't forget it after reading it! I've only read the first book in the quartet, but I'm told that the others aren't as good!